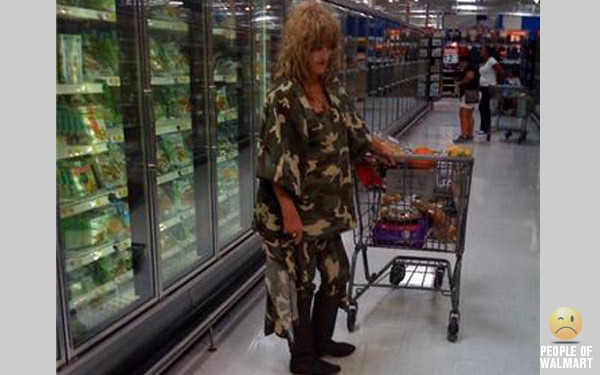 The People of Walmart is one of those blogs that gets me through every situation. For example, if I’m feeling as if I have nothing to wear, I turn to the People of Walmart to show me there are endless wardrobe possibilities for the taking in my own closet. Just when I think my hair cut is getting a little shaggy, I turn to the People of Walmart and realize that it’s nothing a couple of barrettes or a pony tail holder can’t handle. Business in the front and a party in the back, baby. Finally, when life is getting dull or I need a break in the action, the People of Walmart give me the ability to laugh at myself as I realize that could be me in one of those photos, and maybe one day it will be. You won’t find me rocking a mullet or g-string, well, not in public anyway, but I’m sure there are people who don’t agree with some choices I make, either. There are lessons to be learned at Walmart, even for freelance writers. We may think we have it right, but there are other people to answer to. We might think our writing style is interesting or funny, but our clients or readers might find us dull. Something we might consider amusing, someone else might find offensive. If you’re going for style over substance, be prepared for the consequences. 2. There’s a market for everything. Whatever your specialty, whatever your preference, there’s a market for your writing. There are buyers for all niches and genres. Whether you write for business or print, there’s work out there. It may take a while to find what you’re looking for, but it’s there. If you’re good at what you do, you can carve out a good living. 3. There are good ways to grab attention. Your readers appreciate value. They appreciate having information presented to them in a cohesive manner. Readers will always appreciate good content, no matter where it’s published. If you research properly and write for your audience they’ll continue to follow you and support all your endeavors. Grab their attention with good writing and good reporting. Use eye-catching headlines and a kickass opening paragraph. Find a good hook and bring them in. 4. There are bad ways to grab attention. Going for shock or controversy will bring in attention for sure, but once the train wreck is over everyone will go home. This kind of attention is always short lived, and it doesn’t leave the right taste in everyone’s mouth. Consider why your readers trust you, and take it from there. 5. Marching to your own drum is swell on your own time, but sometimes you have to conform. It’s great to be an individual, but when someone is paying you to do a job, you’ll have to conform to their standards. When you’re representing someone else’s brand you’ll have to tone down the flair – unless that’s what they’re looking for. Before you begin any project make sure you and your clients discuss what is expected, and what they don’t want to see. 6. Just when you think you’re done, there’s the checkout aisle. Acting impulsively as a writer isn’t a bad thing. Getting to the end of a piece of writing and adding in a last bit of brilliance to tie it all together can make a project. Moreover, taking the time to read your writing several times over to add a few lines, remove unnecessary words or typos and tweak the finished project is necessary. You wouldn’t complete your shopping trip without going through the check out aisle and you wouldn’t call a piece of writing “complete” without reading it over more than once to make adjustments. 7. Camouflage only hides so much. Extra words don’t hide bad writing, they make it worse. Don’t pad your writing with fluff to up your word count. If you can’t talk about the topic in the desired word count, you probably don’t know enough about the topic. All extra words do is make the piece more confusing. Fluff takes away from the matter at hand. 8. We can better get down to business when we’re comfortable. Freelancers work in pajamas, sweats, shorts and baggies. We’re productive and we’re comfortable. Ties and waist bands distract, who cares who might see us? 9. We are what we wear…er…write. Just as a shopper’s wardrobe might say a lot about her personality, our writing says a lot about ours. Our writing might tell the world if we have a sense of humor (or not), it will say if we’re angry and bitter or calm and rational. Our writing will show if we’re slanted towards a certain topic, or have no affiliation whatsoever. 10. If you’re not careful you’ll find yourself on someone’s blog. Your writing may inspire another writer to react. Sometimes it’s in a positive manner and that other writer will agree, and sometimes it will elicit respectful disagreement. Still other times, your writing will inspire bitterness or anger. When you write, think about how other people will react. Are you prepared to defend your writing? Can you find any comparisons between the People of Walmart and the world of freelance writing? I would add you should roll with what you got. Sometimes writers get caught up on this idea of perfection. Yes, we want to put forth our best effort but revising that article for the hundredth time is really not really helpful. This advice also applies to new writers. Most are afraid to start their careers because they don’t have tons of experience as a writer. You have to start somewhere. Start now! It takes cajones to go out like that– it takes cajones to write for a living. Hehe, sorry, that’s all I got! Be original. People will notice you if you bring something…um….different….to the table. I tend to use PoWM as a fashion guide.